Microneedling is a popular skin rejuvenating procedure that uses tiny needles to improve the overall texture and appearance of the skin. While this beauty treatment has been around for decades, it has regained popularity in recent years. When you come into Euro Image Med Spa for microneedling, you will be able to relax while our trained staff punctures hundreds of tiny holes in the skin. We use SkinPen for microneedling, a medical-grade tool that is only available to skincare professionals. Using the SkinPen, our microneedling services only take about 30 minutes to an hour, depending on the area that is in need of treatment. Also referred to as Collagen Induction Therapy (CIT), Euro Image Med Spa microneedling service uses the SkinPen device to create hundreds of tiny micro holes - or channels - in the skin. 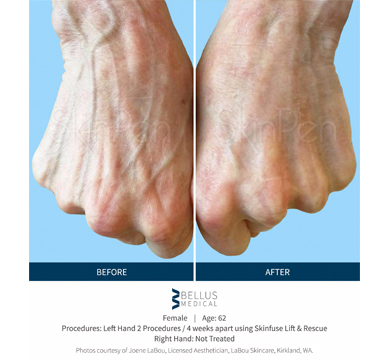 This type of therapy is minimally-invasive and causes little to no damage during the process. The SkinPen is a state-of-the-art device that disrupts the skin cells and the skin’s barrier function temporarily. SkinPen can be used on all skin types and colors, including darker tones that are more susceptible to pigmentation issues. When you come into our office for microneedling, make sure your skin is clean of any makeup, moisturizer, or oils. We will apply a numbing cream to the area in question before using the SkinPen to insert a series of tiny needles. This allows patients to be quite comfortable during the entire process. Some patients report noticing a slight vibration from the SkinPen, but it is not painful. 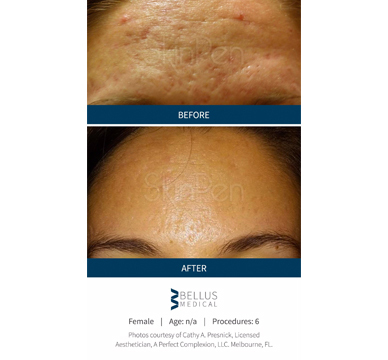 The amount of downtime required following microneedling will depend on the individual and how much surface area was treated. Some slight swelling and redness is typical for anywhere from two to four days. However, some individuals’ skin is back to normal within just 24 hours. To learn more about our microneedling services, please give Euro Image Med Spa a call today. Euro Image is the BEST!!! Great Customer Service and Awesome Services!!! This place is awesome. Procedures fully explained prior to treatment with expected results. Facility is clean and the staff is super friendly. So glad I found this place! I cannot say enough great things about this place so happy I found Euro Image Med Spa. The staff are very professional and the owner truly, truly cares about the costumer I highly recommend them. The skin resurfacing at Euro Image Med Spa have proven that I can turn back the clock. After the laser treatment my skin is soft, luminous, and bright. I am very pleased to report that fine lines have been greatly reduced. A beautiful Spa. I enjoyed a laser skin tightening, excellent service and great value, i will be returning soon. My experience was phenomenal. I received a skin resurfacing, Heand was fantastic. The spa is clean, upscale decor and overall ambiance is delightful. I will definitely patronize Euro Image for a variety of services they offer. Great experience! I have received services at several local med spas and I would highly recommend Euro Image MedSpa. The staff is very professional and welcoming and The nurse injector very nice and knowledgeable. She answered all of my questions and explained the procedure at every step. Zero pressure environment. Will definitely go again for filler. Here at Euro Image Med Spa, we accept the following payment methods. To learn more about Advance Care Credit with 14 months without APR, please contact us. Copyright 2019 Euro Image Med Spa. All rights reserved.